The Malankara Orthodox Church’s prestigious project at Mattanchery to renovate the AD 1751 Church and build the Pilgrim and Heritage Center for the generations is progressing. 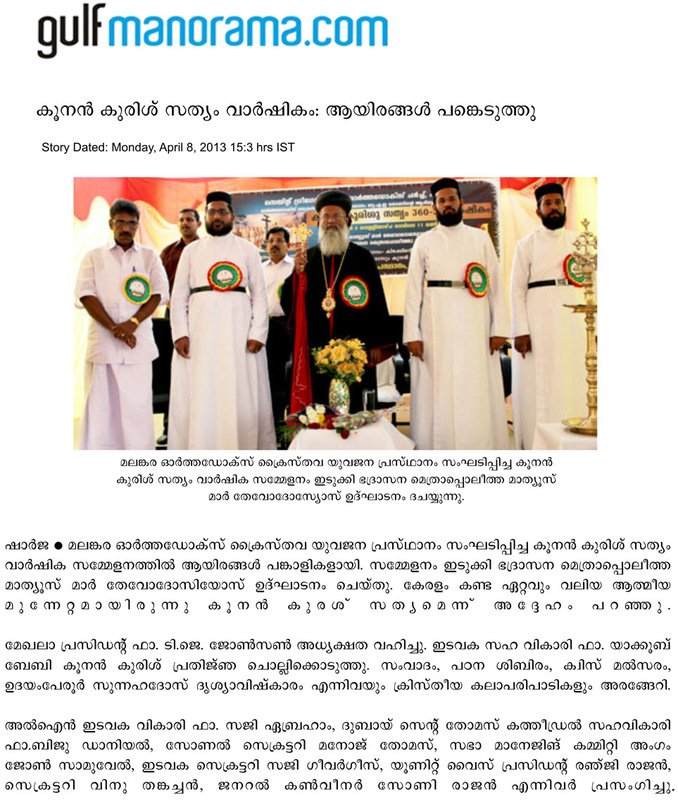 On 3 Jan 2013 His Holiness Baselios Marthoma Paulose II, Catholicos of the East and Malankara Metropolitan, the Supreme Head of the Malankara Orthodox Church inaugurated the yearlong 360th Anniversary Celebrations at the Catholicate Center, Devalokam, Kottayam. On the occasion His Holiness blessed and released the limited edition, serial numbered 360th Anniversary Commemoration Medallion of the Koonankurishu Oath. The Medallion will be awarded to the donors supporting the Koonankurishu Pilgrim Center Project. Golden Medallion for donors of Rs. 50,000/- or more, Silver Medallion for 25,000/- or more and Bronze Medallion for Rs. 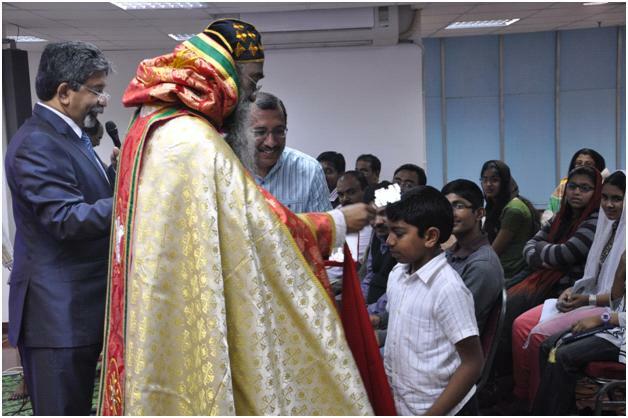 10,000/- were awarded on 25th Friday at St. Mary’s Chapel, Salmiya, Kuwait by His Grace Yuhanon Mar Chrisostomos Metropolitan. A certificate with the serial number of the Medallion with the Blessings, Signature and Stamp of His Holiness will compliment the award. Mr. Jaison P. Varghese, Koonankurishu Council Member and MOSC Managing Committee Member thanked the Donors, Vicar and the Church Managing Committee for their support for the Koonankurishu Project and solicited more support to the A Classified institution of the Malankara Orthodox Church. The award recipients included Ruben Sandeep Pulickal, son of St. Gregorios Maha Edavaka Hon. Secretary Mr. Sandeep Pulickal, Mr. Regi Ommen, Treasurer, Maha Edavaka, Mr. Shaji Abraham, Malankara Sabha Managing Committee Member, Mr. Sony Iduculla, Treasurer, MGM, Mr. Ninan Joseph, Vice President, IOMF, Mr. Mathai Varghese, Secretary, IOMF, Mr. Jose Daniel, Er. P.C. George, Er. Abraham P. Issac, Er. Reju John, Mr. Binu Mathew, Mr. Abu Koshy Abraham Elanjickal, Mr. Jacob Zachariah Karuvelil, Mr. K.V. George, Mr. Thomas Cherian Arthumannil etc. The program was coordinated by Mr. Jaison P. Varghese, Mr. Shaji Abraham, MOSC Managing Committee Member, Mr. Biju Cherian, MGOCSM Vice President, Mr. Babykutty, Mr. Sony Iduculla and supported by the Maha Edavaka Managing Committee. 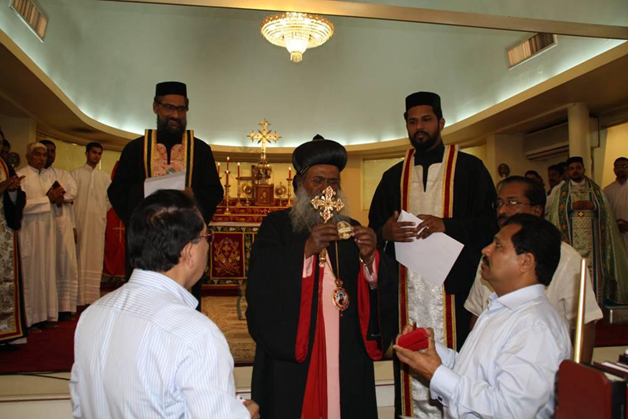 Koonankurishu Sathyam- 360th Anniversary Medallions released in St.George Orthodox Cathedral, Abu Dhabi , by H G Mathews Mar Savarios , the H.Synod Secretary and Metropolitan of Kandanad On Friday 26th April 2013. Medallions were received by M/ S . Jacob Tharakan , Geevarghese Oommen, George Abraham, Shibu P Varghese, I . Thomas Managing Com. Member, Itty Panicker, K E Thomas , Daniel Thampan, M C Abraham, Sunny Sam etc.... Mr. M Varghese received the Certificate. Total Rs. 5.00 Lakhs were collected on the day , which shall be sent to H H . Bava Thirumeni's Account to finance the Koonankurishu Pilgrim Center Development works at Mattanchery.